The Chicago Department of Transportation, under the direction of Commissioner Gabe Klein, has recently unveiled Chicago's Complete Streets Design Guidelines. Nested within Mayor Emanuel's Bike 2015 Plan and the broader Chicago Forward Plan, the Guidelines aim to create a structured standard for the renovation and installation of pedestrian pathways, bicycle lanes, and car lanes. What make the Guidelines unique is the focus to place the pedestrian as the priority transportation user. The Guidelines simultaneously address the needs of bicyclists, public transit users, automobiles, and trucks. Central to the goals of the Guidelines to renovate the Chicago transportation grid are the lofty and admirable aims to eliminate pedestrian fatalities to zero in the next ten years and to reduce pedestrian and bike crash injuries by half in the next five years. 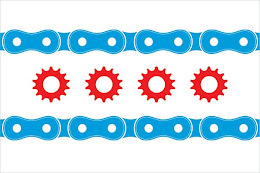 The Illinois Bicycle Lawyers at Keating Law Offices applaud the efforts of CDOT and their continuing endeavors to not only make the streets safer for bicyclists, but for all users. The City should be commended for the honest assessment that many of the city's streets are simply unsafe for pedestrians and bicyclists. This cognizance of the macro-level problems that the users of Chicago's streets face may lessen the degree to which users might identify and antagonize other groups based upon their transportation choice. And that can only be good for all of the users of Chicago's roads and sidewalks.